Cities are beginning to consider the potential impacts that autonomous vehicles will have on their transportation systems and whether those impacts can be shaped to support city goals. A recent article from The Economist explored how pricing can be used to shape the outcomes of autonomous vehicles. The article offers ways that AVs can mitigate certain negative impacts created by cars over the past century. The negative effects that vehicles and vehicle infrastructure have inflicted upon cites, like congestion, sprawl, and ecological damage, could all be reversed through the reallocation of space that is currently dedicated to cars. Alternatively, these problems could get worse if the use of AVs is not effectively managed. It is suggested that road pricing will become more feasible due to an AV’s ability to recognize where the vehicle is at all times, allowing for better congestion management. Ride pricing can also be used to reduce congestion, making peak trip times more expensive. In suburban job centers, public transit systems that have prioritized commuter movement into the central city often no longer match commuting trends of the region. While AVs provide a cost-effective opportunity for ride sharing companies or transit systems to move people more efficiently between suburbs, they could also encourage sprawl by allowing people to live even further from their place of work. Again, pricing mechanisms can be used to discourage this behavior. Lastly, the current auto-oriented transportation system dedicates large amounts of valuable land to parked cars. If AVs reduce the need for parking, this land can be repurposed for higher value uses, and in some cases can even transform the land to provide valuable ecological functions. The Economist argues that the current overuse of space for parking is due to an improper pricing scheme. Essentially, the negative externalities of cars have not been appropriately included in their cost of use. The authors close on the hopeful note that this time around, cities may have learned from their mistakes and will price AVs appropriately to achieve their desired outcomes. Steph Nappa is a Master’s Candidate in Community and Regional Planning and an Urbanism Next Fellow at the University of Oregon. She is examining how to re-design city streets to prioritize bicycles, pedestrians and transit in an era of autonomous vehicles. Over the last few months, we have been talking some about how the trucking industry could be impacted by AVs – see here and here. The push for automation in the trucking industry continues to build. Trucking companies have been installing equipment to partially automate their rigs over the last few years—similar to many features added to mainstream cars/SUVs. This includes assisted braking and collision-avoidance systems. Automated lane steering is coming too. Beyond the tweaks to rigs on the road today, it is expected that over a billion dollars will be invested in the self-driving truck AV innovations this year. The cultural resistance of gear-heads to give up their cars is not a phenomenon that is expected to pose challenges in the trucking industry. Consequently, it is likely that the big-rig operators will be in the AV game far earlier than the ‘average Joe’ on the street. The trucking industry also doesn’t see the complete removal of drivers from the cabs of the rigs anytime soon. Unlike AV cars, long-haul trucks spend most of their lives on the vast stretches of highway that can be less complex to navigate that the chaos of city streets. A study by Roland Berger would give credence to the idea that intra-city truck driving may be harder to automate based on current cost models –but long-haul trucking is more susceptible. Some are projecting that a truck driver’s future career might be piloting trucks closer to home—driving upward to 30 different rigs in a day—guiding them from the highways to their final destinations. Many of the AV truck companies “are almost universally pitching themselves as a friendly partner [to the industry] instead of a job killer” because they are trying to “increase productivity, but also make the job more attractive.” This is going to be very important as there are shortages of drivers nationwide, and AVs may help to make the job more attractive and less stressful. Savings for the trucking industry will come from savings on insurance by reducing crashes, being able to keep drivers driving long and keep them more rested, and by platooning to save on fuel costs. Many of these things are already happening, but as the technologies advance, the savings are expected to grow exponentially. AV trucks are on the road around the country, but their impact is still not quite realized. AVs have real potential to provide easier and more convenient transportation options for people. They have the potential to provide seniors and the disabled access to the world outside of their homes in ways that are now often too expensive to widely adopt. The cost for paratransit, provided by public transit systems, is quite expensive. The Government Accountability Office (GAO) reports that ADA compliant paratransit costs an average of $29.30 per trip in 2010, this is “an estimated three and a half times more expensive than the average cost of $8.15 to provide a fixed-route trip.” And the GAO additionally reports that the cost of paratransit increased by 10% from 2007 to 2010. Consequently, ADA paratransit has the potential to greatly benefit from AVs—which we presume will have substantially lower operating expenses. In the current model of public transit operating expenses are roughly twice that of the capital expenses. And while operating expenses are likely to drop dramatically if we no longer need drivers for paratransit, there still may be a need for assistance on-board AVs that are ADA compliant and utilized for paratransit—but this is an open question. Some discussions we’ve had in our workshops over the last 9 months circle back to when elevators switched from being operated by a human in the elevator, to when they were automated. For about 20 years, so I’ve been told, buildings with elevators continued to staff elevators because people were not comfortable riding an elevator without an operator. Today it seems sort of creepy (most of the time) to have an elevator operator—though some places like the Space Needle in Seattle have an operator, this is less about needing someone to operate the actual elevator and more about the experience. Some of the concerns that have arisen in our discussions of AV busses generally is that the bus drivers provide more services to riders than just driving. They assist riders get to where they need to go. They provide a sense of safety to the riders that there is a public employee looking out for them. The general sense that we have gotten from most people we are talking to is that we will likely need to have employees on AV fixed route buses to act as guides, babysitters, and general monitors to provide riders with a sense of comfort on the busses. It is easy to imagine a woman or child (or anyone really) riding a bus getting scared when a creepy person approaches them—the bus driver (now) or transit employee (in the AV) can help provide a buffer between creepy folks and the rest of us. While AVs have the potential to enhance public transit by providing more efficient fixed route and paratransit services, AVs also have the potential to decimate demand for public transit. Transit systems, bus ridership in particular, are already seeing declines in ridership because of the TNCs (Uber/Lyft)— “Compared to other public transit options, buses are used more for short trips—the kind of trips that ride-hailing companies like Uber and Lyft tend to make.” The utilization of TNCs for shorter trips need to be part of our planning for transit in the long-run with the increasing presence of AVs or we will have to subsidize all riders on public transit even more. Change is coming…change is already here. Urbanism Next researchers Nico Larco and Ben Clark were recently featured on an episode of the podcast GovLov. GovLov, for the uninitiated, “is a podcast about the People, Policies and Profession of local government.” The goal of the podcast is to “explore policy issues that impact local governments and the innovative solutions being used to address them.” GovLov is produced by ELGL—a fantastic (and at times irreverent) local government professional organization. Professors Larco and Clark talk about their recently published report on the impact of AVs and e-commerce on local government finance. You can hear more about how we see AVs shaping local government budgets in the future by listening to the podcast, reading the report, or coming to the ELGL Pop-Up conference in Portland, Oregon on Friday September 22—more info can be found here. Ben Clark (of Urbanism Next) and Mountain View, CA Police LT. Saul Jaeger will be talking about practical issues of AV planning and preparations for local governments. And while it is still hard to know exactly how dramatically AVs will impact our urban infrastructure and budgets, starting to think about AVs now is vital for local governments. “Unfortunately, motor fuel taxes are an increasingly unsustainable source of revenue as fuel efficient hybrid vehicles and completely electric vehicles grow in popularity” — Courtney Moran and Casey Ball. Federal motor fuel taxes haven’t been increased since Clinton was in his first term as president. They simply aren’t a sustainable form of revenue to pay for transportation infrastructure. “A mileage permit, where a driver chooses how many miles to purchase. Odometer readings: A per-mile charge would be based on the vehicle odometer. Automated mileage meter: A device installed in the car would report miles driven. Drivers would choose GPS or not. Smart Phone: A downloadable app would use the driver’s phone to record and/or report miles driven.” Drivers can sign up now to pilot the approach to taxes. Oregon conducted a similar pilot in 2015, with few pilot subjects continuing to opt for the VMT rather than fuel taxes. California, Pennsylvania, and Delaware are also testing out this idea. It may take a few more years to become mainstream, but the inability of Washington, DC (Congress/President) to do anything on raising fuel taxes, coupled with more fuel-efficient cars using few gallons of gas per mile create a situation where leaders will HAVE to do something (hopefully) sooner rather than later. Lyft announced, on July 21st, 2017, that their customers will be able to summon AVs, on some Boston roads, by the end of the year. Test drivers will accompany the customers and cars, during the testing period. Rather than building its own vehicles, like competitor big firms, Lyft designed a ‘common software interface’ that partner automakers can use for their cars. This means that riders in Boston could be using vehicles built by a range of manufacturers (GM, Jaguar, Land Rover, etc). The sensors will be collecting information and interacting with their surrounding as the vehicles begin picking up passengers. This will progressively contribute to a centralized source of data controlled and analyzed by Lyft. The insight will then be shared with partner automakers. It’s still unclear if the carmakers will also receive any revenue from Lyft, for their service. Tech and automotive executives are expecting AVs to play a key role in the future of transportation, which could prevent 95% of traffic accidents, due to human error. Yet, the AV industry still faces State regulatory obstacles. The lack of uniform procedures and expectations could hinder the progress of AVs. Key House subcommittee members unanimously approved a bill, in June 2017, that will make it easier for federal regulators to develop the rules for AVs. If you are interested in learning more about how AVs will have impacts on cities check out Urbanism Next’s recently released report on the impact of AVs and e-commerce on cities. You might also be interested in Nico Larco’s recent post on AVs and Streets. The post was written by SCI Fellow Ramy Barhouche. I’m seeing a giant meteor coming that will, metaphorically speaking, put a huge hole in municipal budgets. This meteor will be AVs. The meteor that pushed dinosaurs to extinction may have done so with one big hit, the AV evolution might be a bit slower. A recent article in Governing Magazine provides us with evidence that the impact of AVs is being foreshadowed by the likes of Uber and Lyft (often collectively referred to as TNC or transportation network companies). Airport managers nationwide are expressing concern in how the TNC are disrupting the budget models that airports have long had in place. Carter Morris (VP with the American Association of Airport Executives) has stated that “airports need to adapt and do it quickly.” Many airports have seen dramatic drops in fees collected from taxi companies and car rental companies because so many people are just using the TNCs instead. So now more than 200 airports nationwide are charging pick-up and/or drop off fees for the TNCs, just as they might have with taxis—though the exact revenue models are quite varied. As fee revenues decline, airports may look to airlines to pay more, which could drive them away from the small/medium size airports. And if you are wondering how much of an impact TNCs are having on the ground transportation game, look no further than “San Francisco International Airport, where TNCs accounted for more than two-thirds of commercial ground transportation in May.” Lyft and Uber are preparing for an AV future, airports should too! To learn more about the impact of AVs on municipal budgets in the Urbanism Next report coming out in late July. You’ll find a link to the report here on the blog. We have often talked about some of the important parameters guiding the future effects of AVs on cities to be the question of AV fleets vs individual ownership as well as AVs cost. Lyft recently announced that its platform will provide 1 billion autonomous vehicle rides per year by 2025 – and they project these rides to be electric vehicles. This points heavily towards a model of mobility as a service – at least in parts of the country – and a dramatic drop in the number of parking spots needed in cities. Supporting the idea that autonomous fleets are in our future, GM (Lyft’s partner in the AV/EV/Ride-sharing arena) said that its Bolt AV will be costing something in the six-figures, most probably precluding it from the private ownership model, but absolutely viable in the ride-sharing model. All signs pointing to Robin Chase’s FAVES in our future (Fleets of Autonomous Vehicles that are Electrified and Shared). Good news for those interested in urbanism and sustainability. A key issue facing cities, states, and the federal government as they ponder the AV future, how do we properly prepare the roadways for AVs? Some suggest putting sensors on roads, but in an already fiscally constrained environment the idea of spending more on our roads for technology that is not yet fully functional is a non-starter. And while building smarter roads would make for safer and easier AV travel, it is clear that companies like Ford understand that “you can’t count on that being there, which is why our technical approach is to build the capability completely on the vehicle,” says VP of research and advanced engineering Ken Washington. The forthcoming Urbanism Next white paper will cover a range local government secondary effects that we expect to see arising from the introduction of AVs. Look for it in the coming weeks. In the last few days, it has become apparent that the owners of the largest fleets of private vehicles, car rental companies, are finding ways into the AV conversation as well. Alphabet (parent of Google and Waymo) recently signed a deal with Avis to manage their fleet. While Apple signed a deal with Hertz to lease vehicles from the car rental giant to test their AV technology. The types of ways in which these partnerships may develop are starting become clear, as Avis owns the car sharing company Zipcar. Waymo executives have indicated that this was one the selling points for the Avis partnership. Zipcar already has a distributed fleet of vehicles around many urban areas that are available on demand for people needing a short-term car rental. While neither Apple nor Waymo appear to have signed any exclusive deals here, they are pointing toward, at least in the Waymo-Avis deal, a shared ownership model for cars and AVs in the future. Will AVs bring doom & gloom or a big boom to the economy? Intel and Strategy Analytics researchers are claiming the impact of AVs will yield a $7 TRILLION boost to the economy. They feel that the effect of AVS “could add as much as $2 trillion to the US economy alone by 2050,” according to a recent article in Wired magazine. Much of the money will, expectantly, go to manufacturers of the vehicles but “mobility-as-a-service will supplant the value of vehicle sales as core sources of shareholder value creation” in the long-run the report says. How do they suggest you get a share of the benefits? Not surprisingly there are a lot of states (or at least their leaders) scrambling for the attention that AVs can create. A recent article on CityLab points to some of the challenges of regulating and encouraging AV development, testing, and innovation. For example, Michigan—a state with a long history in the automobile world—is positioning itself not just as a testing ground for AVs, but also a place where AVs can be developed and built (creating a lot of jobs). While other states that do not have Michigan’s automotive history might just be scrambling to get a little attention by allowing AVs to be tested in their states—perhaps in a way that gives away a lot to the developers by lowering regulatory barriers to testing. The authors of the article point out that “the winning move for states in the competition for AV pilots is simply not to play” but rather to make a strategic decision about whether or not they want to be active or passive players as the technology develops. The scramble for attention could play well electorally but may be a waste of public resources and create distractions or worse. In the wake of this week’s Portland charrette/workshop on the potential of AVs to transform urban spaces, a new CityLab article is right up our alley here at Urbanism Next. What is good for auto companies’ bottom lines, may not be good for cities. The authors of the CityLab article note that “While the industry pushes for national AV standards, cities may want to retain local control over things like speed limits, designating special AV zones, and setting trip fees in order to meet the safety needs of their specific neighborhoods.” Balancing the needs of all levels of government will be a key challenge in the next 3-5 years, being proactive and thinking about these challenges is what Urbanism Next is all about. Benjamin Clark and Nico Larco will be releasing a white paper on some of the financial challenges and opportunities for cities in about a month. Be sure to check back here on the blog for more info on that white paper. Develop their own safety and privacy guidelines related to AVs. Transparency will be the key to a successful innovation, the report suggests. While federal AV policies are likely to be focused on safety, local and state governments have great opportunities to shape policy on how AVs shape our communities. “Cities have an opportunity to come together and lobby their state governments to advance their concerns around the safe operation of AVs in their communities, including insurance requirements and local approval of any proposed AV testing in a city. Tax rideshare or say goodbye to transit? Carlo Ratti of MIT’s Sensable City Lab offers an ominous warning: tax rideshare, or destroy public transit. In his interview with the Australian Financial Review, Ratti brings up important points about pricing rideshare and AVs, and discusses the need to consider city design. On the heels of USDOT announcing 10 pilot designees for testing AV technology, one state is getting out ahead of AVs. Legislation proposed in Massachusetts would ” allow self-driving cars on public roads, but impose a mileage-based tax on their use, allow some large municipalities to ban them, and require all such cars to be zero-emissions vehicles.” (Boston Globe, January 19, 2017) As pointed out in the article, AVs currently fall into a legal gray area in Massachusetts and many states. Article: “Mass law would tax autonomous vehicles by the mile,” by Dan Adams, Boston Globe, January 19,2017. 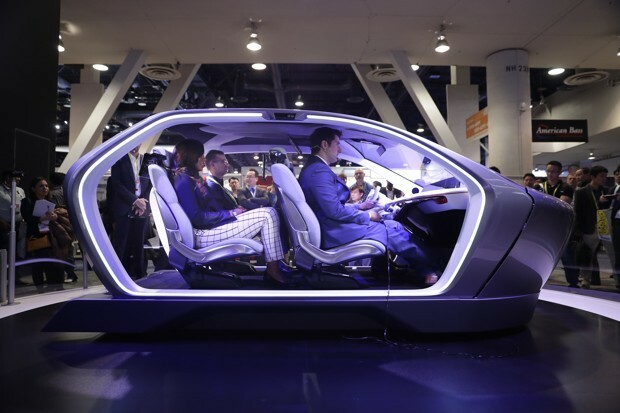 CityLab has posted a report from this years Consumer Electronics Show and – unsurprisingly – the roll-out of AV’s seems to be focused on shared fleets and they will focus on freight and high occupancy transport. Cost seems to be the largest factor early on with AV technology being cost-prohibitive for individual ownership (although Tesla might have something to say about that). Another reason is simply the ability to monitor and modify cars and algorithms – much easier to do roll-out and testing in limited contact points via larger shared fleets. This is not to say that shared vehicles are the only future for AV’s – but thier initiation happening as shared vehicles is promising and gives a bit of time to figure out how best to promote and cement that future over individual ownership – probably the most critical issue in avoiding a dystopian future. This is a two part series from City Observatory that talks about the projected cost of autonomous vehicles and the effects this will have on their adoption (and their marketshare). The first article cityobservatory.org/how-much-will-autonomous-vehicles-cost/ has a collection of cost estimates from various sources. The second article http://cityobservatory.org/price-of-autonomous-cars/ looks at the effects of pricing on everything from AV’s effect on transit to the behavioral effects of our being more aware of the cost of trips (as we may no longer have that sunk cost of the automobile).